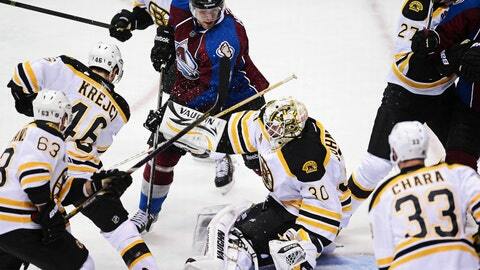 Bruins goalie Chad Johnson stopped 31 shots from the Avalanche. The Boston Bruins became the first NHL team to clinch a spot in the Stanley Cup playoffs. And they did it by refusing to get ahead of themselves. "We still have to play our hockey, really focusing on the little details going into the playoffs, and not getting satisfied and complacent," he said. "We just still have to push our team to the best, maximum results." "He made some saves that helped us a lot," Boston defenseman Dougie Hamilton said. "I thought he played really well." "They slowed us down and they did a good job," Colorado’s Matt Duchene said of Boston. "We hadn’t been shut out all year. Usually, it happens against great teams." "I thought our play was very positive," Avalanche coach Patrick Roy said. "We had a lot of good chances early on. Except for maybe the first six or seven minutes of the start of the third, I thought we played better than them. Their goalie played really well. He made some great saves." "They had some good chances there in the second, and I just tried to be in position and make the saves when I thought I could," said Johnson, who improved to 10-0-1 in his last 11 starts, a career-best point streak that includes a pair of shutouts. "He made a good play to go to the net. I just put it in to him," Hamilton said. "He hit him right in the chest and he had a good finish off of that. I was pretty happy to have that there."